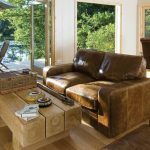 Saxon Maybank’s intriguing properties, last in the ownership of Winchester College’s extensive estate, have been sensitively designed by award winning developers Charteroak Estates. 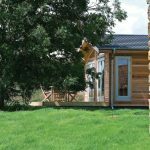 They consist solely of a very peaceful and secure group of just 7 superior timber lodges and 4 distinctive stone barn conversions, all constructed with eco and sustainable materials and methods. 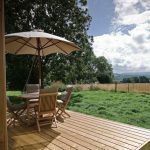 Saxon Maybank is a fascinating selection of boutique holiday homes in a glorious, secluded, location situated 3 miles from the charming Dorset town of Sherborne. The exquisite development nestles within an area of rich farmland whose low wooded hills hide some of the county’s loveliest honey stone villages. This former farmstead is completely surrounded by fields and is approached off country lanes by a long ‘no through’ road. 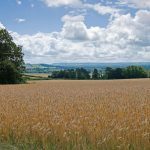 The most outstanding attributes of Saxon Maybank are undoubtedly the unparalleled views, which include a deep swathe through the Dorset Gap from one end of the county to the other. The folded uplands part to reveal a glimpse of Golden Cap, a Jurassic promontory, standing proud above Lyme Bay, the highest point on the whole of the south coast. 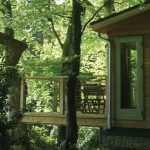 This most impressive view is south facing and the beguiling lodges, some with stone “folly” entrances, are positioned to gain maximum benefit of this truly superb aspect. Despite Saxon Maybank’s rural placement, the delightful neighbouring village of Bradford Abbas is just half a mile walk through the narrow leafy lanes. Sherborne, a medieval market town full of character and old school charm, is a very easy 3 mile cycle or drive back on gentle byways. The town is brimming with fine specialist purveyors of quality foods and excellent independent retailers. It also has superb arts and sports facilities. A choice of two golf courses are available, 1 and 3 miles away respectively. Local fragrant bluebell woods connect to chalky wolds, through a dairy vale embroidered with lacey haw and blackthorn hedgerows, all beating a well worn path through Hardy’s Wessex landscape to the sea. Dorset is one of Britain’s smallest counties but it is packed with personality and is hugely enjoyable. It evokes childhood memories of long lost summers and cosy winters. Full of sentiment, valued principles, empty lanes, local producers, friendly faces, helpful neighbours and honest tradesmen, this is a captivating location which steals your heart and demands many welcome return visits.